The Autobots and Deceptocons are at it again! It is so exciting that Transformers are making a comeback. This cartoon was a real hit with boys from Generation Y, but now these boys have grown up and are having boys of their own. Hopefully, there will be even more 30 years from now as three generations apreciate this awesome franchase. The Transformers franchise (Japaneseトランスフォーマー Toransufōmā) has been around since 1984 and has built up quite a reputation. The new video game, Transformers Legends, absolutely matches the quality that one would expect from the franchise. 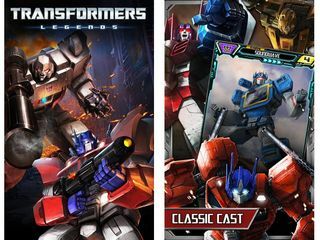 At the beginning of the game, you get to choose your side, Autobots or Deceptocons, and a leader. You’ll be able to play with more than just your initial selection, so don’t worry about missing out on some of your other favorite robots. You’ll start off with a squad of low-end robots and build up from there as the campaign for the fate of planet earth continues. The basic notion of the game is that it’s like a card collecting game. Lots of upgrades as you move along. The game is for free and there are in-game points you can use to upgrade, or you can use real money to purchase certain things as well. You can have a fun gaming experience for free, but it seems that the purchased uploads are worth the money. 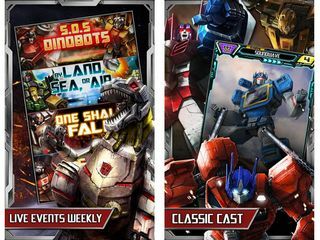 If you’re a Transformers fan who loves card collecting games, then this is most definitely for you! This is Transformers Legends review. Download this game here.